The sitter has been identified on the basis of a label that was once attached to the back of the panel and which stated both his name and age. The figure depicted is Wenceslaus, younger brother of Charles IV, Holy Roman Emperor and King of Bohemia. The panel has proved difficult to date due to details such as the sitter’s clothes, which do not correspond to the fashion of 1371 when the sitter was thirty-four, according to the inscription. 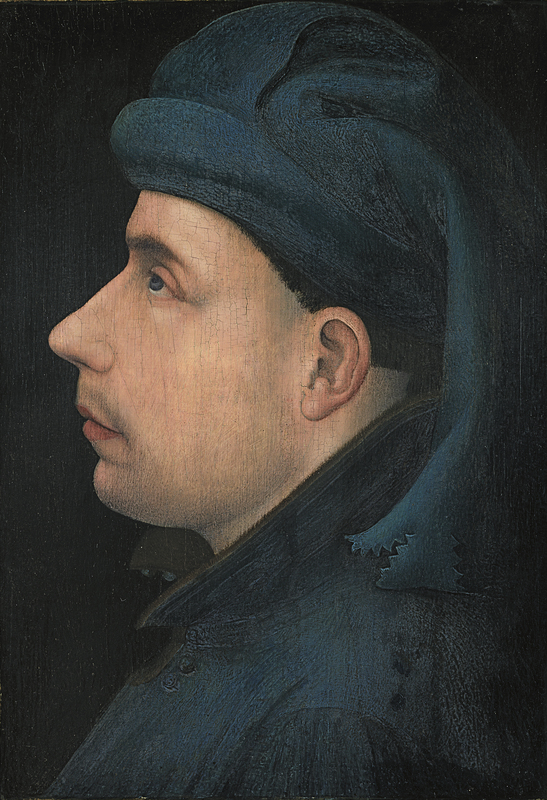 In fact, the manner of presenting the subject, shown in profile against a plain, dark background, corresponds to the style of the early 15th-century, as does the clothing. The portrait has consequently been considered a posthumous one that may be a copy or version of a lost portrait of Wenceslaus in which he was possibly depicted in prayer, to judge from the position of the head and the direction of the gaze. The importance of this portrait lies in the fact that it is the earliest known example of this genre in early 15th-century northern Europe, anticipating the work of the Early Netherlandish school. The identity of this sitter, presented in rigorous profile, was made on the basis of a label that was previously attached to the back of the panel and which stated his name and age. According to that old inscription, the sitter is Wenceslas, son of John the Blind, King of Bohemia, and of Beatrice. Wenceslas was the younger brother of Charles IV, Holy Roman Emperor and King of Bohemia. He was born in Prague in 1337 and married Joan of Brabant in 1352. In 1354 his brother Charles made him first Duke of Luxembourg and in 1355 he inherited the duchy of Brabant through his wife. Wenceslas died on 8 December 1383 without heirs and was buried in the abbey church in Orval. The first doubts regarding the sitter’s identity relate to the clothing, whose style does not correspond to the year 1371 when the sitter was thirty-four, according to the inscription. In addition, the type of presentation, against a plain, dark background with the face in profile and realistically depicted, is more in line with early 15th-century portraiture, to which period the style of clothes also belongs, as does the distinctive type of hat. For these reasons the portrait has been considered a posthumous image that might have been inspired by or which might copy a lost portrait of Wenceslas in which he was depicted as a donor, to judge from the position of the head and the direction of his gaze. Sterling suggested that the model might have been a portrait in a triptych commissioned from the artist Jean de Woluwe by Wenceslas’ widow one year after his death. Whatever the case, the painting must have been commissioned from a leading artist to judge from the results. It has been assumed that the commission would have originated in a circle close to that of Wenceslas, possibly from Anthony of Burgundy, son of Philip the Bald, to whom Wenceslas’ widow bequeathed the duchy of Brabant as her husband died without an heir. This idea would create a link with the figure of Margaret of Austria, who inherited the duchy in the 16th century. Two inventories of her collections (of 1516 and 1523/24) include a portrait of the Duke of Brabant, which may be the present panel. Three drawings are known of Wenceslas of Luxembourg, one of which is in the Recueil d’Arras in Arras and the other two in the Recueil Succa in Brussels. The head in the present panel has been singled out for praise by both Rosenbaum and Sterling, who considered it to be one of the most perfect and advanced portraits executed in northern Europe in the early 15th century and a work that looks forward to the ars nova of Robert Campin and Pisanello.